A WEEK of events is coming up in East Sussex aimed at recognising the vital role played by people who care for a family member or friend. Local charities are coming together to back Carers Week, which runs from today (June 11) to 17 June, and this year has the theme of supporting carers to stay healthy and connected. During the week, a series of events is running across the county organised by local charity Care for the Carers and a wide range of partner organisations. Care for the Carers estimates that over 65,000 people in East Sussex now support a relative, friend or neighbour who could not manage without their help due to illness, disability, a mental health problem or an addiction. Events are being held in locations all across East Sussex including Eastbourne, Newhaven, Rye, St Leonards, Uckfield and Brede, where the public can meet staff from Care for the Carers and other organisations including the Association of Carers and the ICE Project, a local organisation that supports carers of people with mental health problems. 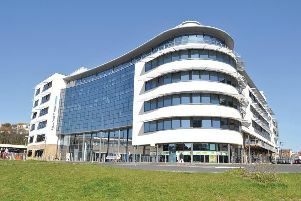 Meanwhile, the Woodlands Centre for Acute Care, in Hastings, will host carers’ afternoons, a cake sale and picnic, and a free Carers’ Fun and Information Day will be held at the Isabel Blackman Centre, also in Hastings. The Towner Gallery in Eastbourne and Hailsham Freedom Leisure Centre will run special offers for carers all week, with the Towner’s artist-in-residence Jenny Arran, running a free creative workshop for carers on Thursday 14 June, 2-4pm. A carer awareness training session at Eastbourne District General Hospital on Tuesday 12 June, 9.30am – 12pm is open to professionals, volunteers and people who support or would like to support unpaid carers in their community. Full details of events happening across the county, including pampering sessions, fun days, picnics, open gardens, creative workshops, carer training sessions, and cream teas, are available on the Care for the Carers website at www.cftc.org.uk/news/carers-week-2018-events . Who are carers? A carer is someone who provides unpaid care and support to a family member or friend who has a disability, illness, mental health problem or who needs extra help as they grow older.